John Richard Underhill's research has in part been supported by research grants from the Natural Environment Research Council and the Oil and Gas Authority. The views expressed in this article reflect his own personal views based upon this work and are not influenced by any company or funding agency. He has not received any research funding for activities associated with hydraulic fracturing. Gas is hugely important to the UK. The country uses more than 65 billion cubic metres to heat most of its 25m homes and generate around a quarter of its electricity each year. Despite efforts to move to renewable energy sources such as wind and solar, demand for gas is likely to remain high for the foreseeable future. Until 2004 all the gas the country needed was sourced from the UK, primarily from the North Sea and East Irish Sea. Since then, production has declined to the point where indigenous gas provides only 45% of the total. The shortfall comes from European pipelines (38%), particularly from Norway and Russia; and liquid natural gas (LNG) deliveries (17%), primarily from Qatar. This dependency on foreign gas is precarious to say the least. We saw this in March 2013, for example, when an unseasonal cold snap almost left the country short of supplies. It was averted by an LNG delivery docking at Milford Haven in Wales in the nick of time. This late in its lifespan, conventional new gas exploration in the North Sea is unlikely to reverse this situation. This is why many argue that the UK should consider all options, including onshore shale gas. They point to its success in the US and the recent announcement that Centrica will decommission the UK’s main gas storage site in the southern North Sea, making the country even more reliant on imports to meet the demand. Meanwhile, opponents raise understandable concerns about the environmental impact of the hydraulic fracturing – fracking – that would be involved and on the industrial scale required. This seems to have resonated with the public, with support for fracking recently hitting an all-time low of 17%. The Conservatives included a commitment to shale production in their June election manifesto, but only if “we maintain public confidence in the process”. Yet both sides tacitly assume that fracking would work if exploration drilling went ahead. They pay little attention to whether the country’s geology is suitable for shale oil and gas production. The implication is that because fracking works in the US, it must also work here. In fact, the UK’s geological history suggests this is probably wrong. For a “sweet spot” suitable for commercial fracking, a number of geological criteria need to be met. The source rock needs a relatively high organic content, a good thickness, sufficient porosity and the right mineralogy. The organic matter must have been buried and heated in such a way as to produce large amounts of gas. There must also be a relatively simple geological structure. The most successful US shale areas, such as the Marcellus, Barnett, Haynesville and Bakken, all lie at depths and temperatures that mean they are ready to expel their oil and gas when fracked. The basins in which these occur are primarily in relatively stable, undeformed areas away from the edges of active tectonic plates, which geologists refer to as “intracratonic” basins. They are characterised by continuous layers of rock with only gentle dips and few fractures or major faults. This all aids subsurface imaging, gas/oil detection and the directional drilling needed for shale exploration. A cursory look at the geological map of the UK shows a very different proposition. The whole land mass has been significantly uplifted by a chain of geological events that started some 55m years ago with the upward rise of a plume of magma under Iceland. This helped break the tectonic plate in two, pushing Greenland and North America in one direction and the eastern segment containing the British Isles in the other, forming the Atlantic Ocean in between. The crust moving east buckled against the stable tectonic interior of continental Europe, not only uplifting the British Isles but also tilting it so that north-west Scotland was elevated the most. For this reason, the oldest rocks in the UK are in places such as Lewis and Harris while the youngest ones occur in south-east England. This movement profoundly affected many of the basins of sedimentary rock that make up the British Isles – including those considered to contain large shale resources. Areas once buried sufficiently deeply to experience temperatures where oil and gas are generated were lifted to levels where this could no longer occur – unlike in the US where the relevant rock formations remain at their greatest depth of burial today. The UK rock formations have also been highly deformed by the buckling to create folds and faults that cause the shales to be offset and broken up into compartments. At the same time, the activity created pathways that have allowed some of the oil and gas to escape. One example is the Weald Basin of southern England. What originated as a major area for sedimentary deposits in the Cretaceous period between 65m and 145m years ago was subsequently deformed into a major anticlinal arch, such that the original basin now sits in its uplifted core. The margins of this tectonic fold are particularly well defined since they are marked by the steeply dipping chalk ridges that form the North Downs and South Downs in south-east England. As for other UK basins said to hold large quantities of shale gas, like those containing the Carboniferous Bowland Shale in Lancashire and West Lothian Oil Shale in Scotland, they went through an additional previous episode of deformation about 290m years ago. This has compounded their structural complexity. 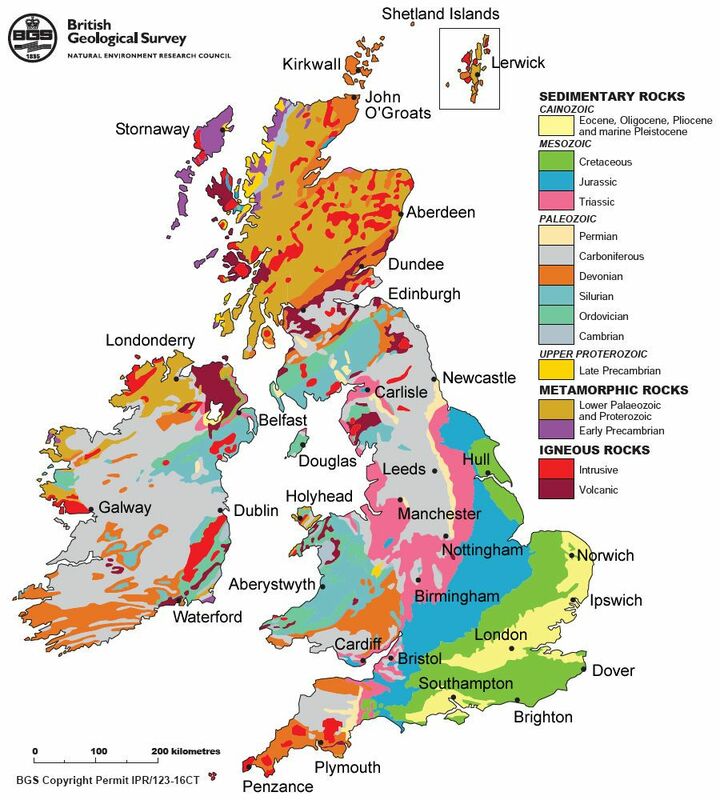 In short, even where a shale source in the UK may have high organic content and thick and favourable mineralogy, the complex structure of the basins will be detrimental to ultimate recovery. Yet the only question that has been addressed to date is how large the shale resource could be in the UK. The inherent geological complexity of the sedimentary basins has not been fully appreciated or articulated. As a result, the opportunity has been overhyped and reserve estimates remain unknown. At the very least, there is a need to factor this considerable and fundamental geological uncertainty into the economic equation. It would be extremely unwise to rely on shale gas to ride to the rescue of the UK’s gas needs only to discover it is 55m years too late.